ELPEDISON is strongly committed to strengthening its ties with its host communities. Discussion forums, an ongoing dialog with all parties involved and a lasting relationship with the local stakeholders are only some of the tools of this process, particularly in terms of ELPEDISON’s ability to listen to and involve the host communities in the shared development of new projects. Under this context, ELPEDISON tries always to cover any recruitment needs from the local labor market, provided all professional qualification requirements are met. During the construction of the Thisvi plant, the agreements with the local contractors and sub-contractors were more than 200, while a significant number of people got employed through them, in order to undertake mainly supportive services and tasks. On top, ELPEDISON supports crucial areas for the welfare of the local societies, such as Health and Education. It provides critical technological infrastructure to local schools, sponsors repair works to educational institutions and gets dynamically involved in matters with which local communities are concerned. Under the context of supporting the Education sector in the local society where ELPEDISON operates, for the last 2 years it sponsors Office and Sports equipment to the High School of Domvraina, in Viotia, dedicating to this action a significant effort. Furthermore, ELPEDISON has recently undertaken the works for the restoration of the school building, both inside and outside. In terms of supporting Health in the local comminuties ELPEDISON operates, it has been collaborating with Doctors of the World / Médecins du Monde – Greece (MdM-Greece), This organization has been founded in 1990, being a medical humanitarian non-governmental organization as well as member of Médecins Du Monde International, which consists of 15 delegations (Argentina, Belgium, Canada, France, Germany, Greece, Japan, Luxembourg, the Netherlands, Portugal, Spain, Sweden, Switzerland, United Kingdom and the United States of America). The guiding principle underlying MdM’s activities is that every human being has a right to humanitarian assistance, irrespective of their gender, race, sexual orientation, religion, ideology or political persuasion. The long term goal of MDM is to make healthcare a basic human right. 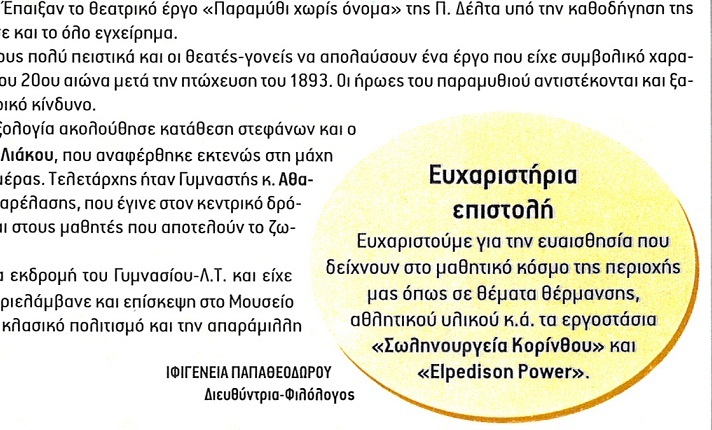 ELPEDISON action took place between 23-24/5/15 in Domvraina and Xironomi of Viotia, where in collaboration with Medecins du Monde, Corinth Pipeworks and Industrial Area of Thisvi and MdM, we provided medical examinations/vaccination to the population of the 2 villages. Overall, around 15% of the total population did welcome the action and 120 persons of all ages had been medically examined. The supplied Medical Services included General Practitioner, Orthopedic Doctor and Ear,Nose & Throat Doctor.